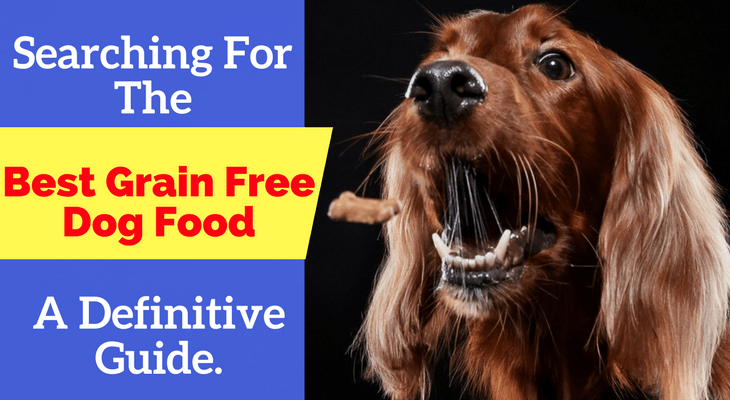 Searching For The Best Grain Free Dog Food? A Definitive Guide. Tasty, healthy and affordable: have a look at the best grain free dog food options in 2019. What is the Best Grain-Free Dog Food? The primary reason why most homeowners acquire dogs is to provide them with a little company. But, did you know that keeping a dog confers a wealth of benefits to your well-being, too? And, I'm not just talking about your safety. Based on reliable research studies, dog ownership makes you feel less stressed, have a healthy heart and grow old gracefully. Surprisingly, a dog also has the capacity to detect cancer given their keen sense of smell. But, these abilities do not come on a silver platter. Like newborn babies, dogs require attention, shelter, and, most importantly, food. That's right—dogs are a handful! But it is only by feeding them that they will thrive and have the energy to play, run, and work on being a dog. Speaking of food, grain-free dog food is highly recommended by pet experts across the globe. This article explains why grain-free pet food options are ideal while highlighting the best grain-free dog foods on the market. What is the Best Grain-Free Dry Dog Food? While the modern dog seems to have evolved from a wild animal to an Internet superstar, his digestive tract has not changed. Subsequently, the ideal diet for your mutt is one containing numerous proteins, moderate levels of fat, and zero grains. Like the concept behind the Paleo Diet for humans, a protein-based and grain-free diet works best for your dog’s digestive system, for several reasons, the most important one of which is that it comes close to a natural dog diet before these creatures were domesticated as pets. As reported by PetMD, a grain-free diet keeps your dog feeling full. It also reduces canine food allergies, gives your dog more energy and a healthier skin. Additionally, as a pet owner, you should examine how the product is formulated and the specific additives added to the recipe. Some brands incorporate probiotics while others use scientifically-proven antioxidants. Now that you understand the significance of this diet, let us compare grain-free high-quality dog food brand options with high protein. Although you will find a plethora of pet products on the market, here is a list of the best grain-free dog food. Based on our research, the Purina Beyond Dry Dog Food has a rating of 4.7 out of 5 stars. By purchasing this product, you get two 4.5-pound bags of the Purina dog food. This food is made primarily from chicken meat and eggs. This product is free of all kinds of grains, as well as the artificial preservatives and flavors. Essentially, this dog food contains 100% natural ingredients. These ingredients are rich in proteins and other essential vitamins and minerals. The composition of this dog food stresses on balance; hence, guaranteeing that your pooch does not suffer from deficiencies. 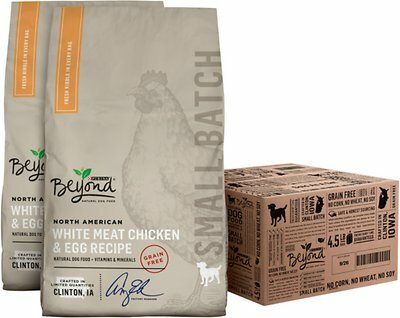 The Purina Beyond dry dog food is perfect for dogs in their adult stage. 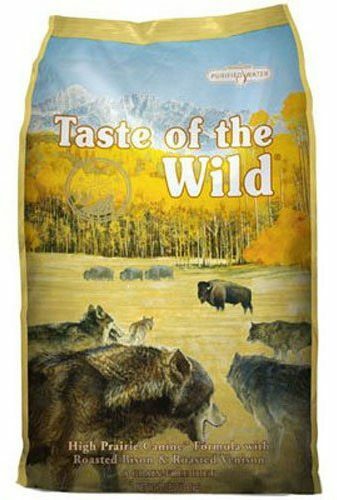 Taste of the Wild is truly as its name suggests: quality and tasty ingredients and deserves a rating of 4.8 out of 5 stars. Taste of the Wild is another very popular grain-free dog food option for pet households. Aside from excluding grains in the product, the company has added probiotics that work well in promoting your dog’s stomach, coat, and skin. 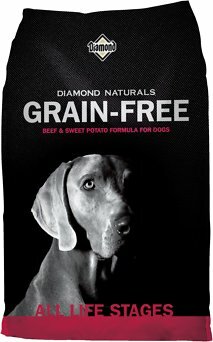 The Diamonds Natural is also among top rated grain-free dog foods has a rating of 4.7 out of 5 stars. The Diamonds Naturals has emphasized on meat proteins, with its first ingredient being real beef. Such a protein-based, grain-free dog food is essential when it comes to optimizing digestion while still limiting exposure to possible allergens. Furthermore, Diamond—the manufacturing company—consists of a mix of potatoes and vegetables. But, the best features about Diamond Naturals brand entails the source of its ingredients. All the beef is pasture-raised, the chicken is cage-free and any fish included is wild-caught. If this sounds like something you’d like for your dog, do not hesitate to place an order. Besides, you have an option of choosing from three flavors namely whitefish & sweet potato, beef & sweet potato, chicken & sweet potato. 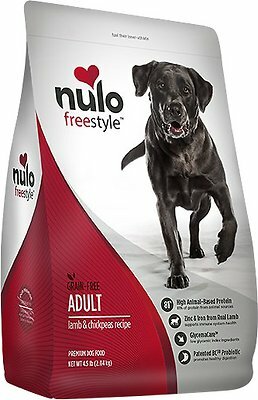 There is a lot to admire in the Nulo FreeStyle dog food, ranging from the probiotics to high protein and low carb content. It is why we rated it at 4.8 out of 5 stars. Although it’s a relative newcomer to the pet industry, Nulo foods is already receiving raving reviews from pet owners. The Nulo FreeStyle was manufactured ground up with the average dog’s nutrition in mind. Similar to the Zignature brand, Nulo avoids chicken (especially chicken fat) in its formulas. The company cites triggering allergies as the reason for excluding chicken ingredients. At least 80% of the protein in this product is obtained from animal sources. Another reason that contributes to the increasing popularity of this dog food is that it uses less of the glycemic ingredients like lentils, chickpeas, and sweet potatoes. Most of these elements have little to no nutritional value. 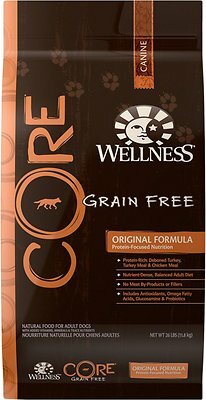 If there is one pet brand that is known the world over then it has to be the Wellness Core line of dog foods. We gave their Grain-Free version a rating of 4.7 out of 5 stars. Apart from providing different flavors, Wellness Core provides grain-free dog foods in either wet or dry options, and those for puppies, large breed and small breed dogs. In addition to the key ingredients, Wellness always add some fruit and vegetables, which are rich in vitamins and minerals. All its ingredients are completely natural; hence, you do not have to worry about your dog consuming nasty chemicals in the form of food. Grain-free dog food is superior to its grain-filled counterpart. The former category offers multiple benefits including less exposure to allergens, healthy skin and coat, as well as a boost in energy levels. Do consider shifting your pooch to grain free dog food if you haven't yet, and even to a limited ingredient diet, if you can. Find The Best Dog Food For Chihuahuas And Avoid Malnutrition!